All-Wheel Drive for Optimal Traction. Take your vehicles where the work is with the power of all-wheel drive. Spicer transfer cases give you the power of all-wheel drive, so you can take your trucks where the work is. Across sand, mud, ice, or snow, you will have maximum power in all transmission speeds and in just about any off-highway application. Spicer transfer cases can be coupled directly to a Spicer auxiliary transmission, providing full torque capacity to both front and rear axles. Transmission Parts That Offer Performance in All Conditions. For midship mount, stationary, and direct mount applications. In addition, Spicer transfer cases offer all-wheel drive when you need traction or additional power when you disconnect it. They are adaptable to meet midship mount, stationary, and direct mount applications, and they are also conventionally geared in a 1:1 ratio with optional front-wheel disconnect, available in manual or air. Spicer transfer cases can be coupled directly to a Spicer auxiliary transmission, providing full torque capacity to both front and rear axles. 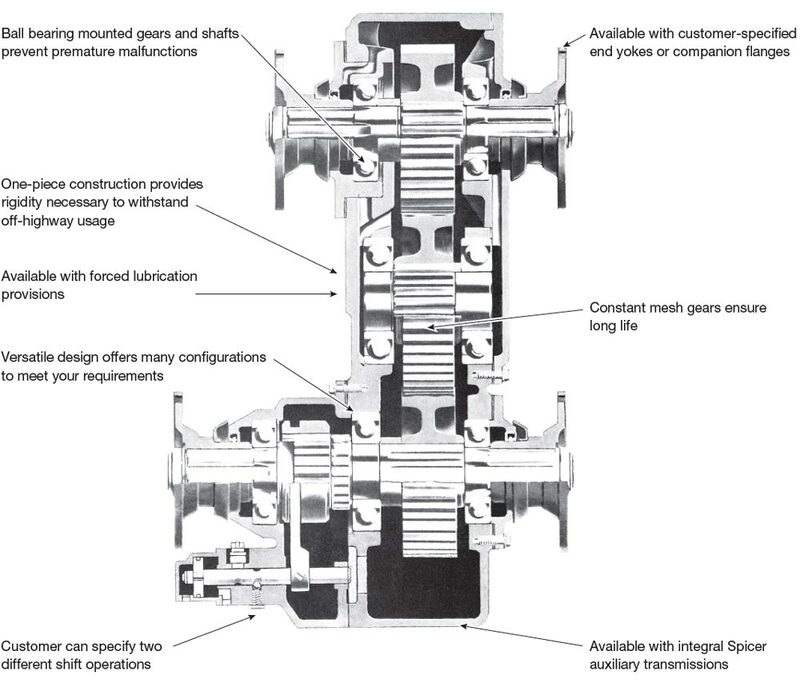 Expand the image below to see the Spicer transfer case features and benefits, or download the brochure on the right to see an overview of the various transfer case models that are available. Discover how Spicer transfer cases are part of a complete drivetrain solution for the industrial vehicles that you rely upon, and learn how Spicer parts have met exact Dana standards to become the most trusted name in off-highway applications. Learn more by locating an Off-Highway Service Center near you today.